I'm always struggling to get my boys to eat their vegetables. I cook healthy meals and always try to serve a side of fruit or veggies for every dinner. Green Giant® has made it easier for me with their Seasoned Steamers. We tried the Mediterranean Blend at our last meal. It was a hit. Both of my sons as well as my husband liked the flavor of the veggies. We usually have leftovers with side dishes, but we at the whole bag of the Seasoned Steamers in one sitting. In fact, one of my sons liked the Mediterranean Blend better than the main meal. I've always believed my children learn the best when they eat well balanced meals. I'm glad Green Giant helps complete my cooking. 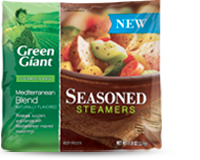 Green Giant is offering my readers a $1.00 off coupon to try Seasoned Steamers. To print coupon click HERE. 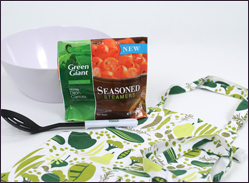 One of my lucky readers will get a chance to try Green Giant Steamers free through a prize pack offered by Green Giant and My Blog Spark. November 1, 2012 at 11:59 EST. Disclosure: The coupons, information, and gift packs have been provided by Green Giant® through MyBlogSpark. I would like to try the Brussels Sprouts. Tuscan flavored brocolli..!! Thanks for this giveaway! The Mediterranean Blend sounds really good. I would love to try their Brussel Sprouts. I'd like the grilled potatoes! I would like to try the grilled potatoes. I'd love to try the backyard grilled potatoes. I would use the Tuscan Seasoned Broccoli first. I would like backyard grilled potatoes...ciao4now64 at yahoo dot com. I'd like to try Backyard Grilled Potatoes! They look yummy! Id use Brussell sprouts with my Mac and Cheese. I've never had them so I'd like to try brussle sprouts. We'd love to try tuscan seasoned broccoli! Their Honey Roasted Sweet Corn sounds like a great accompaniment to some fried chicken! Backyard Grilled Potatoes sound great! I'd use the Tuscan seasoned broccoli - parmesan sounds delicious! Backyard Grilled Potatoes is what I'd like to incorporate. I'd try the backyard grilled potatoes with a nice steak! I would try the Tuscan Seasoned Broccoli. Thanks! I would love to try the Honey Dijon Carrots! Their Mediterranean Blend sounds great! I would like to try the Backyard Grilled Potatoes with my next meal. I'd like to have the Backyard Grilled Potatoes. I would choose the Backyard Grilled Potatoes. Backyard Grilled Potatoes for me. Tuscan Seasoned Broccoli looks good! I would love to try the Broccoli, Cauliflower, Carrots & Cheese Sauce! It looks so delicious! I choose the backyard grilled potatoes. I would love to incorporate the Backyard Grilled Potatoes into my meal. I haven't tried them yet, but the Honey Dijon Carrots sound really good. Thanks. I'd like to have the Select Sugar Snap Peas for our meal!